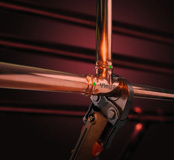 From pipe to fittings to radiant heat technology – Viega is one of our most trusted manufacturers. They are innovative and are dedicated to producing consistently high quality products. Read our feature in Viega Voice Magazine. Click on the picture below to watch their video on their patented ProPress Technology. And, now, Viega is unveiling their newest Press Technology – MegaPress for black steel installation of water, gas, and fire protection systems. TJ’s considers radiant heat to be the most comfortable, efficient heating available today. It works great in conjunction with multiple heat sources, such as geothermal, solar, high-efficiency gas-fired condensing boilers, oil boilers, and air-source heat pumps. When considering radiant – Viega is the obvious choice. Viega ProRadiant heating systems can be installed in new construction and in existing homes, over wood or concrete. It is easy to connect for new additions or outside applications. PEX is cross-linked polyethylene. In other words, it is a type of plastic pipe created when links are formed between polyethylene molecules while the pipe is being manufactured. As a result of this “linking” process, the ViegaPEX Barrier tubing and FostaPEX tubing used for plumbing and radiant applications is more durable under temperature extremes or chemical attack. These attributes make ViegaPEX ideal for both drinking water and hot water applications like radiant heat. 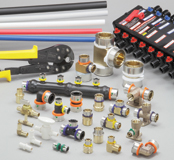 Components designed to integrate with one another for ease of installation. Lower thermostat settings – every 1ºF of decrease in thermostat setting translates into a 3% energy reduction. Lower water temperatures – a 10ºF decrease in water temperatures equals an energy savings of 3-5%. Precise zoning – allows for unoccupied rooms to be set at lower temperatures. Better source of heating for allergy sufferers – no forced air movement is involved, so dust and allergens are not moving around the home. Adds excellent resell value to a home. Allows for lower boiler temperatures, saving energy and increasing boiler life expectancy. Superior way to heat a home. Warms other surfaces in the room (i.e. : furniture, etc.) turning them into heat emitters. Viega offers solutions for all applications ranging from existing retrofit to new construction, wet and dry mass systems. ProRadiant Systems are a highly efficient, even heat distribution solution that produces energy savings of up to 30%. Less air movement can reduce the amount of dust and allergens. Viega tubing will not bang against walls and floor joists. The MANABLOC system allows the homeowner to shut off water supply connections as easily as they would shut off electricity at their electrical outlet.